If this wasn't complicated by injury I think he would be there. Monahan joining the WJC team is best for his development. Whether he's Calgary's second line center or not is irrelevant, especially at this stage of the rebuild, and of a poor season. I agree with Butter's take on the situation. An experience like that will only heighten his career. Look at the memory of Toews and Eberle. They dominated and everyone remembers. The same goes for Gaudreau. Monahan has been on losing teams cosistently the last 3 years and it's about time he gets a feel of what it's like to win something. While some of what you say is true there is the flip side to that process. RNH went to the same tourney last year and played somewhat hurt. He ended up not able to finish the season last year and took the surgery route. Didn't help him one bit as far as I can see. There is no reason to say he will be recovered in time. There is no reason atm to believe he would be ready to play even if he has mostly recovered. That alone brings down the odds that he would get this huge development boost from playing there that you seem to envision him getting.. I think this is the right call. He's getting the type of minutes and opportunity you want here so I think it's best to keep him under your eye. Who knows what type of role they have there and as much as we'd like yo assume canada will be successful what if they repeat last year or the last few years? I think it's a dumbass bonehead braindead move that goes against everything a rebuilding team should be doing. "He's an NHL player that should be getting NHL minutes"
-"but he's not getting NHL minutes"
-"but, hey, if he wasn't injured, he would be"
-"and just because he's a 19 year old kid and we've rushed him to the NHL, and given him top line minutes, and now he's injured, doesn't make us the Edmonton Oilers"
-"Sure, we're just as bad at developing our prospects, but at least we don't televise it on Flames Change"
-"And, what if he got injured in the world juniors? It's too risky"
-"Isn't he already injured playing unsheltered minutes in the NHL? -"Never mind that. Hudler's got his back"
-"And imagine if team Canada lost.....how much that would set back his development"
-"It's better not to get his hopes up as at all, and be clear with him now that there's absolutely no chance of him competing in Any sort of Playoffs or tournaments for a Long, Long, time. Set the bar low, and nobody gets dissapointed"
-"after all, winning breeds winning. And we don't want any breeding going on. That would just be weird"
-"Great point man...we are Good at whatever it is we do! We should Televise this..."
Having a bunch of Americans running the show probably plays into the decision a bit. Why not take a little shot at Canada's ability to win the tourney if you can? The best move for him would be to play in the WJHC. Wow JJ don't hold back lol Say what you are really thinking! Burke: I don't want him going. We are trying to win games here. Burke: I want to win not end up like Edmonton with their attitudes up there. Keeping Money in Calgary might win us an extra couple of games. And that folks is the bottom line. Well that and putting butts in the seats, both of which Money helps this team accomplish. He's an NHL player now, playing with MEN, not BOYS. WJHC is all about boys showing they are better than the other boys and have the possibility of being able to play against men. Simply put, Mony has proven he can play with men, there is NO developmental value to him playing at the WJHC. What makes this decision seem even worse is the fact that none of the Flames picks will have an opportunity to play for Team Canada. Poirier, Klimchuk and Janko all had a shot, but Poirier was the most likely based on his year. Mony was basically assured a spot on the roster, but was not released, so now Hunter Sh**tcan could take his spot. By the looks of it, the only players we send to the WJC are Gillies and (possibly) Rushan "the Russian" Rafikov. Seilov messed up his chances as captain with the injury and nagging infections. Like you are saying, he's not playing 4th line minutes with the Flames. He's playing 1st/2nd line minutes and top situations in the NHL against the best of the best. He's also producing offensively so it's not like he needs the WJC for an ego boost against weaker competition or anything. His development is better served with the Flames. Although, he's losing his scoring touch a bit these days. WJC could've done him some good i feel. There are alot of reasons for going to WJH and against I would like to see a Poll on weather he should stay or go depending on his health so lets say poll wise if healthy should mon play for WJH or stay here and help the team I would say the team doesn't need his help that bad we will see bottom 6 to 1 pick over all with him or with out him. I would do the poll but have learnt to stay away some 1 will not be happy if I do so some one a little more repitable on here should do it . For a guy that played hurt, RNH did a stellar job for team Canada. He was one of the top players and difference makers. The issue wasn't RNH though, it was the goaltending call. The love affair with Subban was disgusting, and it cost our country the gold. The team couldn't even stay competitive. Binnington and especially Brossoit should have backstopped the team as a tandem. You sound like a Leafs fan. I remember how they had a post about no more American management because they didn't like Burke. Look what he did there, and how the team is now. Too bad he was fired before he could enjoy what he built. Don't hear Leafs fans hookinging now either! If I had to make the decision I would send him to the WJC if he is healthy. I don't see the downside. Monahan hasn't played for a winning team and he doesn't have playoff experience. So I think there is a development opportunity even though he is playing well at a higher level. The Flames aren't going to make the playoffs, and giving Colborne/Backlund additional minutes isn't going to hurt them. That said, I don't think it is the end of the world that he isn't going. He is hurt and there isn't any reason to put pressure on him to come back early. He is playing well at the NHL level so going back to juniors is a big step back. He would be missing out on NHL games to go to the WJC so the net development might end up as a loss. Also, it sounds like Monahan would rather play in the NHL. I would be okay either way. I wish he was going. But I am not super upset that he isn't. Especially considering his injury. I have no issue with Burke, he's the most Canadian of our management team in any event. And he understands junior hockey. 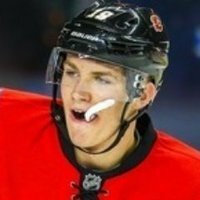 Feaster has no motivation to send Monahan to the WJHC. He and Weisbrod don't understand junior hockey or the value of the WJHC. It shows in their obsession with college players, and particularly Americans college players. Monahan needs to be in a winning room. Learning how to win is a critical soft skill. He's not getting that in Calgary. He's not a leader in Calgary, he would be in the WJHC. So many reasons. We're talking a couple weeks out of the lineup, like 5 games? Not a whole season. He should have went, end of story as far as I'm concerned. Agree with you on Feaster. Not a big fan at all. I just think Monahan should stay because he is playing big minutes for a rookie and is a critical part of the future of the franchise. I could understand if he wasn't playing much and sending him, but he is playing a lot with pros and I don't think playing with jrs is really that critical for his development now. As far as winning being part of his development, what if Canada loses again? Right now being on a team that isn't winning doesn't look like its hurting his development that much and thats against pros not kids. He should stay, end of story as far as Im concerned. Just remember: You only want him to. He's not. He's not even in the lineup. He's out of the lineup. He started off the season on an incredible streak leak we've never seen, but now he's becoming more and more the stereotypical 19 year old in the NHL. Average, full of mistakes, and injured. For a 19 year old? Unbelievable. I can already see all the replies about how I hate Monahan. Nope, I just call it like it is. I think he's an Amazing 19 year old. Maybe they'd both be in the lineup right now. Instead, the reality is that most nights, neither of them are in the lineup. As far as I'm concerned, nobody on here who wants Monahan in the lineup can ever legitimately complain about tanking for draft picks. If you don't care how we perform on the international stage, I can't even begin to understand how you would care about winning or losing anywhere else. I don't see how anyone can dismiss our performance as a Country in hockey, and ever begin to comment on pride, winning, or losing. All validity is lost. I am not sure if I get, what you want to say. First Monahan is out of the lineup because of injury. He has shown great work ethik, was eager to learn. So why should he not stay with the Flames to learn from NHL players? Does he learn more at the WJC? Baertschi has only been scratched for a couple of games. The expectations for Baertschi are higher, since this is his second "full" season for the flames. To name RNH and Eberle and that they learned what it means to be on a wining team (Hall has participate at the mens WC, so he can be named too) hasn't helped Edmonhton a bit. We wanted Monahan to stay in the NHL, he has proven that he can play in the NHL. Why do we want him to play with the junior national team now? I want Calgary to win the Stanley Cup someday, but that means every player has to sacrifice nearly everything for this goal. From then on there is no national team anymore! And the trip starts here, when we build a team that will be in the playoffs one day, that will have the potential to win the cup. If we are not in the playoffs this year he may play in the A-National Team. Monahan has a hairline fracture of the foot following a slap shot in practise. That can happen at any level. Be isn't hurt because the Flames rushed him. The guy is amazing for 19 years old.... Start of the season he was no body and teams underestimated him. But now teams are aware when his on the ice and try to smother him as much as possible its pretty normal. His amazing kid can't wait to see where he is going to be in 5 years from now. Monahan himself said the NHL is his goal this year. Not the Wjr's. He was diplomatic enough to say he would have been proud to wear the Mapleleaf for Canada but that the NHL was his goal. Maybe Feaster is right and almost 20 mins NHL time is better development than taking him out of the lineup for a Junior level experience. I won't argue with Monahan if that is the way he feels though. "You" are the one who wants him to have the Juniors experience too, so don't hang this "Just remember: You only want him to" because he wants that too. Sounds like he is recovering nicely. Maybe some should consider the Calder discussion in all of this too. It is my conviction that fans are underestimating Sean Monahan...Conspicuously, he may not be a flashy player but his contributory efforts are discernable...He can be counted to stand up for his team when the need arises. However, he is still a young player and it will take time for him to develop his talents. That said, I can envision him to be the Sidney Crosby for the the Flames! I never had any doubt about the player after we selected him. He was exactly what we needed for this team. Only 19 and he is already playing big minutes here. First year in the NHL and he is already a big part of our success. I doubt there is much chance of him becoming less of a player, so I think we have a great player for years to come. As far as I'm concerned, nobody on here who wants Monahan in the lineup can ever legitimately complain about tanking for draft picks. I'm not blaming the Flames for keeping him in the NHL....he took that decision away from him. I do question the unsheltered minutes, and the benching of Baertschi. Seems reverse-intuitive. Blaming the hairline fracture on practice is plausible, but also convenient. Monahan's blocked shots in almost every game he played in this year, including two games after that practice. There's a reason it got worse.